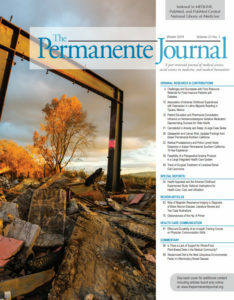 The latest Permanente Journal is now available for download, and includes a variety of peer-reviewed articles and studies on topics from radical prostatectomy for high-risk prostate cancer to a primer on osteonecrosis of the hip. This edition also includes a closer look at the effectiveness of a clinical communications course offered at the Colorado Permanente Medical Group to help physicians communicate better with patients. Read more about what’s inside this quarter’s Journal and click on articles of interest below. Or you can download the PDF for the complete edition. In semistructured phone interviews with food insecure patients in a diabetes clinic affiliated with a safety-net hospital, the prevalence of food insecurity was high (60 percent). Provision of written and verbal information alone about community food resources resulted in low linkage rates (0-4 percent), even with individually tailored referrals. Misperceptions about eligibility, fears around government program registration, inaccessibility, lack of information retention, competing priorities, an inability to cook, stigma, and a perceived sense of stability were major barriers to use. Personnel-guided, in-clinic enrollment to a food resource facilitated a higher connection rate (31 percent). A total of 110 Latinos aged 18 years and older residing in Tijuana, Mexico, completed interviewer-administered questionnaires, including the Adverse Childhood Experiences (ACE) scale (range = 0 to 10 items), at baseline in 2015. We studied the prevalence of ACEs (score on the ACE scale) and the presence of depressive symptoms, identified in 14 percent of participants. In multivariate analyses, for each additional ACE item reported, participants were significantly more likely to meet criteria for depression. The authors randomized 150 patients to usual care (UC), educational information only, or educational information and pharmacist consultation. Patients age 64 years and older who received 2 to 3 nonbenzodiazepine sedative-hypnotics (Z-drugs) fills in 2016 were included. Patients who received education only and education plus pharmacist consultation were significantly more likely to discontinue Z-drug use than those who received UC (28/50 of those who received education only and 27/49 of those who received education plus consultation vs 13/50 patients who received UC). The authors present a large retrospective case series at a psychiatric clinic involving clinical application of cannabidiol (CBD) for anxiety and sleep complaints as an adjunct to usual treatment. The final sample consisted of 72 adults presenting with primary concerns of anxiety (47) or poor sleep (25). Anxiety scores decreased within the first month in 57 patients (79.2 percent) and remained decreased during the study duration. Sleep scores improved within the first month in 48 patients (66.7 percent) but fluctuated over time. CBD was well tolerated in all but 3 patients. Updated analyses (with 7.5 years of follow-up) show little if any evidence for carcinogenic effects of gabapentin. All odds ratios for 3 or more and 8 or more prescriptions were moderately reduced by control for smoking and alcohol. Sensitivity analyses did reveal a markedly increased risk of vaginal cancer in gabapentin users with epilepsy compared with users without epilepsy. In KPSC, from 1/1/2001 to 7/1/2015, 1829 patients underwent radical prostatectomy with pelvic lymph node dissection (RP+PLND) (241 high-risk, 943 intermediate-risk, 645 low-risk). Positive margin rates were 17.8 percent, 14.8 percent, and 11.9 percent in the high, intermediate- and low-risk groups. Five-year overall survival was 92.5 percent in lymph node-positive patients and 94.9 percent in lymph node-negative patients (p = 0.8). Age, prebiopsy prostate-specific antigen, and clinical stage were associated with positive surgical margins in patients with lymph node metastasis (LNM). Recipients of RP+PLND with LNM and positive surgical margins required adjuvant treatment. The authors conducted focus groups and interviews with 8 recently vaccinated Kaiser Permanente Northwest members aged 11 to 17 years and their parents, and 7 clinical staff who routinely vaccinate children. All participants expressed willingness to use previsit education, breathing exercises, social support or distraction, and water consumption. Patients and parents expressed a need for verbal education and messaging about potential vaccine-related outcomes, and clinicians noted a need to identify patients who are anxious before a vaccination visit. Most participants suggested a “Comfort Menu” intervention. The authors evaluated 78 patients from Kaiser Permanente East Bay in whom Grade 3, human epidermal growth factor 2 (HER2)-negative invasive breast carcinoma was diagnosed between 2015 and 2017 by core biopsy to compare HER2 status with excisional biopsy specimen. The rate of clinically significant HER2 status discordance is low. However, given the dramatically improved survival conferred by trastuzumab therapy, our findings support reflex HER2 testing of surgical specimens for patients with core biopsy-diagnosed HER2-negative breast carcinoma. Forty-three US State Health Departments (SHD) had YouTube channels. They posted 3957 videos, accumulated 12,151,720 views, and gained 6302 subscribers. In total, 415 videos were manually coded. Information about the agency (17.6 percent), communicable diseases (12.5 percent), and mother/infant health (8.9 percent) comprised the largest share of topics. No statistically significant association was observed between the log-transformed number of videos posted on an SHD’s YouTube channel and any of the explanatory variables of SHD staffing and expenditure in 2011. Eighty-five intervention and 51 comparison participants agreed to participate and completed the baseline survey. At baseline, intervention participants reported transportation (52.9 percent), housing (38.2 percent), and social isolation (32.4 percent) needs, whereas comparison participants identified employment (33.3 percent), food (33.3 percent), and housing (33.3 percent) needs. Intervention participants reported higher satisfaction with medical care (p = 0.01) and higher satisfaction with cost concern assistance. Although most practitioners (80 percent) reported discussing medical care costs with their patients, only 18% reported knowing about their patients’ financial well-being. Existing participants (45; mean age 71 years) of community-based Parkinson Disease group movement classes (mean length of participation 11.8 months) also participated in an individualized 6-session protocol for exercise support that emphasized self-regulation through barriers completed validated self-report surveys. Changes in exercise self-efficacy mediated a significant relationship between changes in self-regulation and physical activity. Changes in social cohesion mediated a significant relationship between changes in physical activity and mood. Changes in mood and social cohesion had a reciprocal, mutually reinforcing relationship. Among 510 patients enrolled during 1 year, 442 (87 percent) received anemia screening laboratory tests. Half of those with laboratory results were eligible for further optimization: 207 had anemia; 21 had iron deficiency without anemia. Of 228 patients eligible for optimization, 189 (83 percent) had anemia addressed preoperatively; of 129 patients with iron deficiency anemia, 102 (79 percent) received intravenous iron preoperatively. Rapid adoption of robotics has introduced a paradigm change in prostate cancer treatment, with more than 80 percent of prostatectomies performed robotically in 2015. From 1/1999 to 9/2015, all Kaiser Permanente Southern California members who underwent surgical treatment of suspected renal cell carcinoma (RCC) were included retrospectively. The study included 5237 patients. During our study, partial nephrectomy became the most common surgery for treatment of localized RCC. Since 2014, robot-assisted laparoscopic partial nephrectomy has become the most common renal oncologic surgical modality in KPSC. This article describes the origins of the Division of Health Appraisal in Southern California Permanente Medical Group’s San Diego Department of Preventive Medicine, which provided a comprehensive and nontraditional array of preventive medicine services to more than 50,000 members a year. The fusion of Health Appraisal with the Positive Choice risk-abatement services provided the origins of the now internationally recognized Adverse Childhood Experiences Study and its major implications for the outcomes and costs of medical care. A literature review and 2 cases with a challenging diagnosis of motor neuron diseases are described, with a thorough discussion of how the diagnosis was suggested on the basis of magnetic resonance imaging evidence in each case. Such findings might enable clinicians to reach an early diagnosis that can improve the patient’s quality of life and prolong survival. In this report, the authors deliver a concise and up-to-date review of osteonecrosis, a pathologic, painful, and often disabling condition that is believed to result from the temporary or permanent disruption of blood supply to an affected area of bone. The epidemiology, pathogenesis, etiology, clinical manifestations, diagnosis and classification, and treatment options for hip osteonecrosis are discussed. A 65-year-old man, diagnosed with idiopathic pulmonary fibrosis in 2007, was being monitored by a conventional pulmonologist while being treated with weekly acupuncture targeting a Chinese medicine diagnosis of spleen dampness and lung qi weakness and with botanical medicine targeting the stimulation of adrenal dehydro-epiandrosterone secretion. He survived for 10 years after diagnosis. Many patients with cancer use Viscum album extracts (VAE). Also called European mistletoe, Viscum album can lead to improved quality of life and reduced chemotherapy side effects and may have synergistic cytotoxic and proliferation-inhibiting effects when used together with chemotherapy. The patient remained tumor-free in follow-up examinations and has enjoyed good health for 20 years after initial diagnosis. Treatment with VAE in this case might have contributed to the reduction of side effects from high-dose chemotherapy and may have acted synergistically with high-dose chemotherapy in tumor control. Ibutilide is recommended by professional society guidelines for the cardioversion of atrial fibrillation and flutter. Its rapid effect and minimal impact on hemodynamics make it well suited for use in the Emergency Department. Ibutilide, however, prolongs the corrected QT interval and increases risk for ventricular tachycardia. The authors analyzed the effect of a 3-day dedicated course on clinical communication skills among 65 clinicians assessed by a randomized patient survey. Patients were significantly more satisfied with their physician on 6 specific communication skills after the physician received the Communication Skills Intensive training. The effect persisted at 12 months’ follow-up. In addition to the improved patient satisfaction scores, attendees stated that they learned many practical communication skills and valued the course. Kaiser Permanente significantly promotes plant-based diets and continuously incorporates plant-based nutrition on the front lines with their dietary recommendations. Despite a continuously growing body of evidence and the meticulous work of renowned experts in this field worldwide, the latest findings in this area have not found their way into US national dietetic guidelines. Why is this the case? What role do physicians play in this context? Is there potentially a lack of support for whole-food, plant-based diets and comprehensive lifestyle change programs in the medical community? Representative environmental factors such as smoking, breastfeeding, nonsteroidal anti-inflammatory drugs, antibiotic use in childhood, oral contraceptives, and appendectomy do not correlate with disease onset in most patients with inflammatory bowel disease (IBD). Diets rich in animal protein (risk factor) and deficient in dietary fiber (preventive factor) are characteristic of westernized diets in affluent societies. Recent reports on IBD therapy that replaced westernized diets with plant-based diets achieved far better outcomes than those previously reported in the literature. We believe that westernized diet-associated gut dysbiosis is the most ubiquitous environmental factor in IBD.